It’s beginning to look a lot like Christmastime at Disneyland. 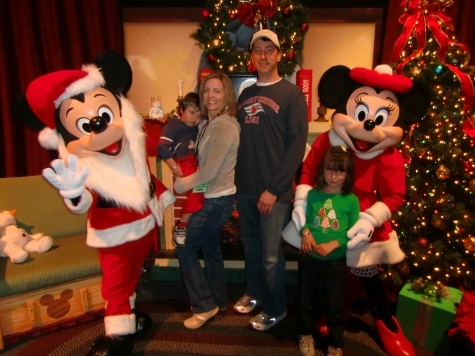 Mixing the wonder of the holidays with the magic of Disney makes for some very jolly family fun. Here are photos of the special touches, decorations, and treats of Christmastime at Disneyland and Disney California Adventure to get you in the holiday spirit. Christmas touches are everywhere at Disneyland during the holidays. 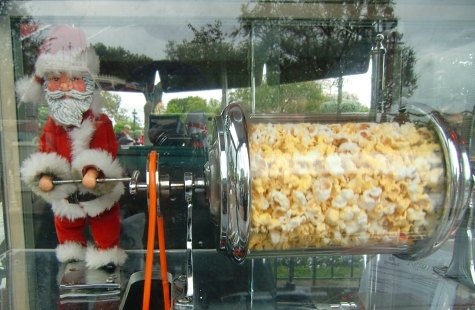 You’ll even see Santa spinning popcorn inside a vendor’s cart! 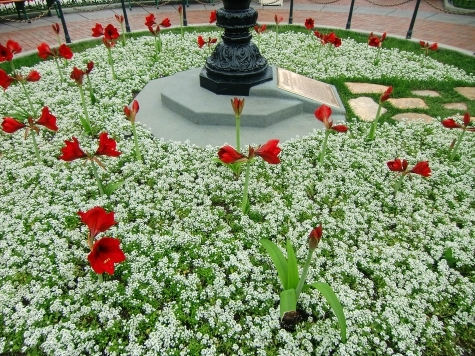 This Christmasy display of white Sweet Alyssum and red Amaryllis greet Disneyland visitors at the start of Main Street USA. 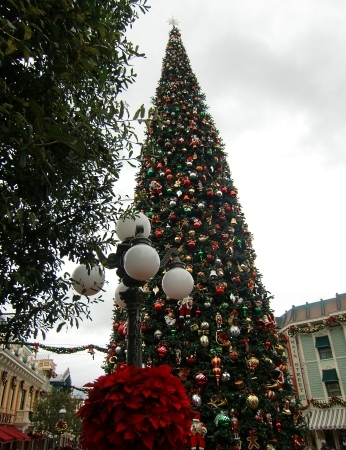 This giant Christmas tree is the focal point of the traditional decorations featured along Main Street. 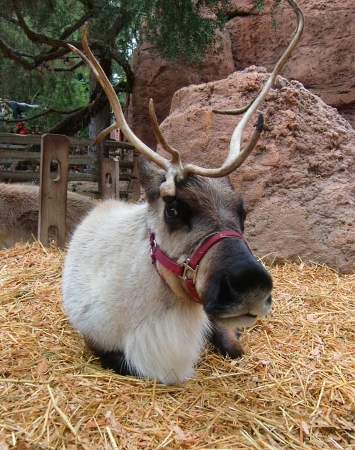 Stop by Santa’s Reindeer Roundup to see real-live reindeer like this handsome guy. “It’s a small world” is all dolled up for the holidays with lights, characters, and decorations. 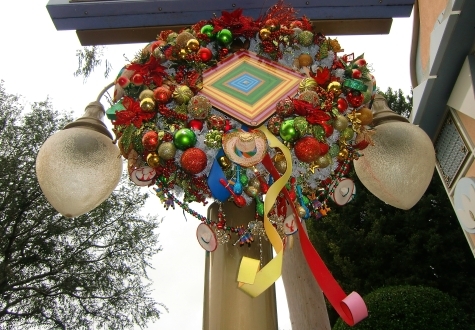 Modern wreaths near “It’s a small world” Holiday represent different cultures, like this Mexico-themed wreath. 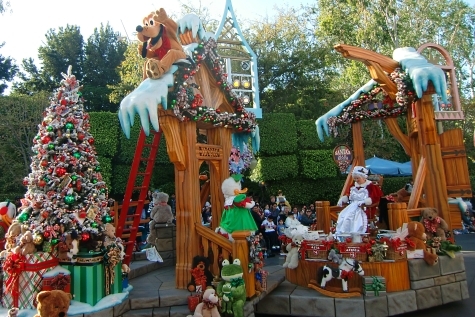 Mrs. Claus is joined by Pluto and other Disney characters in A Christmas Fantasy Parade. Santa rides on a separate finale float. 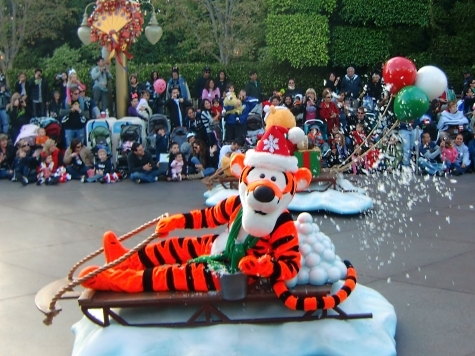 Tigger tosses a handful of “snow” at parade viewers. 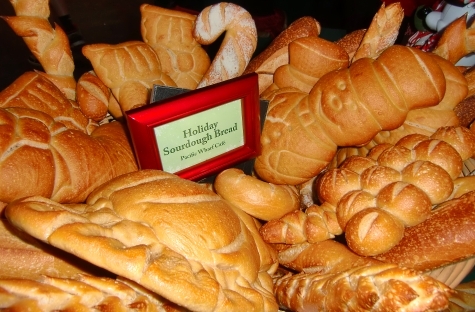 You can buy a tasty loaf of sourdough bread in the shape of a snowman, Christmas tree, candy cane and other holiday designs at the Pacific Wharf Cafe at Disney’s California Adventure. There are plenty of holiday-themed Disney treats and gifts available for purchase throughout Disneyland, Disney’s California Adventure, and Downtown Disney District. If you want to get in the Disney holiday spirit but don’t have the cash to spend on entrance tickets, you can always head to Downtown Disney District to take in the twinkling lights and do some Christmas shopping. Disney characters like Mickey and Minnie are dressed up for the holidays and happy to pose with your family at both Disneyland theme parks. For more detailed information about the special rides and activities offered, read Holidays at Disneyland! What’s your favorite part about Christmastime at Disneyland? Tell us in the comments! A Note from The Travel Mama: Thank you to Disneyland for inviting my family and me to visit Disneyland at Christmastime as part of a blogger event! 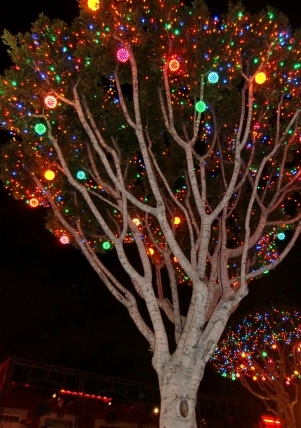 I’m ashamed to admit that I have NEVER been to Disneyland during the holidays – and I’ve lived in SoCal my entire life! I’m feeling the itch this year, though, so thanks for sharing the highlights! Oh, Debi, you MUST go to Disneyland during the holidays sometime. It’s my favorite time to visit! Our family spent New Year’s Day at Disneyland last year and loved it! I think I might have been even more excited than the kids as I had always wanted to see Disney decorated for Christmas. 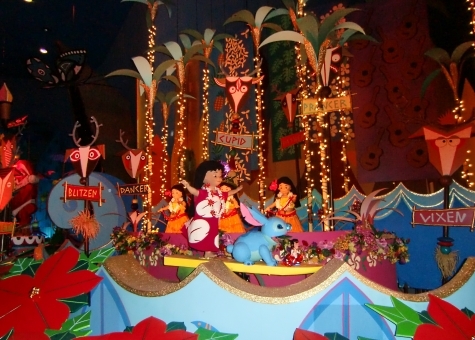 It’s a Small World was a definite highlight as was the Christmas parade. Our kids don’t know yet b/c their Christmas present is always a trip but we’ll be flying to Orlando on the 28th this year so we’ll be seeing Disney all dressed up for the holidays again. Lisa – How wonderful that their Christmas present is always a trip! I love that idea. Kids tire so quickly of toys but the memories from family vacations last a lifetime. 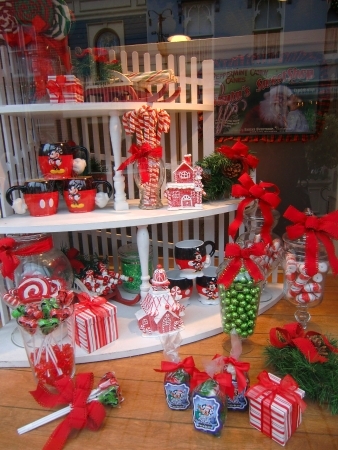 Enjoy Disney World all dolled up for the holidays! We’ve spent the last five Christmas mornings at Disneyland, and there’s no place else we’d rather be. You nailed it when you said Downtown Disney is a great place to be. They do such a good job of making everything feel so festive, I don’t even miss the snow! My kids favorite part though is the Holiday Haunted Mansion. Once we finally convinced our youngest that it’s not scary, they’ll ride it over and over again. Steve – What a wonderful family tradition. I would love to spend Christmas day at Disneyland! My 3-year-old is just now getting over some of his amusement park fears; this last trip was the first time he wasn’t afraid of the Winnie-the-Pooh ride (if you can believe it!). I think it’ll be sometime before I can convince him to ride the Haunted Mansion but my 6-year-old loves it!